This brief text gives insight on the viewpoint of Shahid Mutahhari on Salatul Jumuah and its importance. This lecture was given in the year 1380 AH in Tehran, Iran. What is Salatul Jumu’ah? Salatul Jumu’ah is simply the same Salatul Dhuhr on the day of Friday (Jumu’ah) - however it has a few differences from the regular Salat that we perform. First off, the Salatul Dhuhr that we commonly perform is four Rak’at, however Salatul Dhuhr on the day of Friday – whose name is Salatul Jumu’ah – is only two Rak’at. So then how did it happen that this Salat was changed into a two Rak’at Salat? We will discuss this point later on. The second difference is that it is obligatory (wajib) that it be performed in congregation (Jama’at) however it is not obligatory to perform any of the other Salat in Jama’at - Salatul Dhuhr, ‘Asr, Maghrib, ‘Isha and Fajr. The third difference is that in which ever locality Salatul Jumu’ah is held – it is obligatory (wajib) upon the people who live within a distance of two Farsakh (12.48 km) in every direction to attend that Salat, except if they have a valid excuse. The fourth difference is that in which ever locality the Salatul Jumu’ah is established, it is not permissible for another Salatul Jumu’ah to be held for a distance of one Sa’a (6 km) – and thus, only that one Salatul Jumu’ah can be held. Just imagine if such a Salat were to be held (keeping these laws in mind) - what kind of enormity and magnitude it would hold! If for example in this city that we are presently in – meaning Tehran – if there was to be one Salatul Jumu’ah held here1, then we would see that for the distance of two Farsakh (12.48 km) – from the point we are presently at until the north point of Shimran and to the south point near the city of Ray and from all points stretching from the east to the west of this city – everyone would gather in one area. In addition, for a distance of 12 kilometers from this point people from all around would join all together for this Salat and for a distance of 6 kilometers, no other Salatul Jumu’ah would be permitted to take place and thus, we would be limited to this one Salatul Jumu’ah. Just imagine what kind of a great gathering would take place at that time! This means that this general prayer for all people - this Salat which all people must gather to perform and which must not be like the other Salatul Jama’at that we sometimes see taking place in the Masjid where people are scattered about (with small groups of Salatul Jama’at individual from one another) - and in which it is obligatory that before the Salat, two speeches are given – this Salat must be preceded by two speeches which actually take the place of the two Rak’at of Salat. During the time that the Imam (of Jumu’ah) is giving the speech, the people must listen to what he is saying – all people must remain quiet and must not say a word – they must be listening to the khutbah. As long as the speaker has not come down from the chair on which he was standing to deliver the lecture, all of the people in attendance must be sitting as if they were in a state of Salat. Of course there is one exception here that the Imam of Jumu’ah who is giving the speeches need not be sitting or facing the Qiblah. Thus, these two speeches which are obligatory in this Salat actually take the place of the two Rak’at of the Salat of Dhuhr. every single person – wherever he is and whatever work he is doing - must drop everything and rush towards Salatul Jumu’ah and must listen to the two speeches and then perform two Rak’at of Salat in congregation (Jama’at) and after this, he would be free to go back to work. Haste unto remembrance of Allah and leave your trading. Meaning that they must rush towards the Salatul Jumu’ah and must leave their business transaction aside. It is forbidden (haram) to indulge in business transactions at this time. Thus, they must rush towards the Salat and listen to those two speeches. In the Salatul Jumu’ah, it is obligatory to give two speeches – not just one. Thus, the Imam must give the first speech then sit down for a short period of time remaining quiet, and then once again stand up and deliver the second speech. First off, the praise and glorification of Allah (Glory and Greatness be to Him); secondly, prayers and blessings must be sent upon the Finality of the Prophets – Muhammad ibn ‘Abdullah (blessings of Allah be upon him and his family) and the (twelve) A’immah of the religion (peace be upon all of them); thirdly, the people must be advised to a series of important commandments which we will explain later on in this discussion. The fourth thing is that a short Surah from the Qur’an must be recited. All of these elements are things that we possess within the faith of Islam – (nothing has come from outside of our teachings). Again, so that we can actually understand how important the issue of this gathering is, we see that in the Islamic narrations it is mentioned that it is even obligatory upon those who are working in the prison system, the management and even the police and guards of the prisons to not only be present at Salatul Jumu’ah, rather, they are even obliged to bring those people whom they are responsible for guarding in the prison (the inmates). Thus, the prisoners must be taken out of the prisons so that they may participate in Salatul Jumu’ah - this great gathering. They too must listen to the speeches and then when the Salat is finished, they are to return back to their prison cells. The Imam who performs the Salatul Jumu’ah must also follow certain manners and etiquette. These include that he should wear a Turban (‘Ammamah) on his head – meaning that he should have something covering his head, just as the ‘Ammamah of the Prophet (blessings of Allah be upon him and his family) was. May Allah protect Agha Hajj Agha Rahim Arbab from Isfahan. Maybe many of you have heard about this man. He is one of the high ranking scholars in the fields of Fiqh, Usul, Philosophy and ‘Arabic grammar and is even versed in the traditional sciences. He is also a student of the late sage, Jahangir Khan Qashqa’i and just like the late Jahangir Khan Qashqa’i, till this day he too wears a simple hat made of an animal skin. His appearance is just as other scholars from the point of view of the ‘Aba, Qaba and his physiognomy and the only difference is that he wears a simple animal skin hat. He is also one of those people who firmly believes in the institution of Salatul Jumu’ah and he himself also used to lead the Salat in Isfahan. However, since the people who would come to the Salatul Jumu’ah were not the kind of true believers and were not of those who firmly believed in Salatul Jumu’ah, the Friday prayer was not that great and magnificent Salat that Islam has envisioned it to be. However, whenever he comes for the Salatul Jumu’ah, he always has a small ‘Ammamah upon his head which he wraps around his head once or twice. This verse means that these people who have no sense of upbringing and training and who still possess the traits and qualities of the people of the days of Ignorance - when they spot some merchandise or hear the drum or other instrument being played, they leave you (the Prophet (blessings of Allah be upon him and his family)) standing alone and run after the goods and merchandise. This verse refers to the event when one time, the Prophet (blessings of Allah be upon him and his family) was standing, busy delivering the speech of Jumu’ah. All of a sudden, the sound of a drum which was a sign that a business caravan was making its way into the city, was entering the gates of Madinah. The people – due to fear that all the goods would be sold out fast – ran to buy the merchandise that were being offered and left the Prophet (blessings of Allah be upon him and his family) standing alone. Thus, you must be standing when you give the speech for Jumu’ah. It has been stated that it is an innovation in the religion (Bid’ah) to sit and give the Jumu’ah speech which is something that Mua’wiyah (ibn Abu Sufyan) brought into Islam. 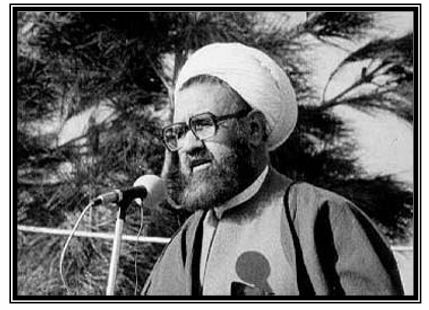 Another condition is that the Imam, while standing and delivering the speech, must be leaning on, or holding in his hand a sword, spear or a stick and he must deliver the speech in this fashion. In the khutbah of Salatul Jumu’ah, in addition to the praise and glorification of Allah (Glory and Greatness be to Him) and the remembrance of the Noble Prophet (blessings of Allah be upon him and his family) and the A’immah of the religion (prayers be upon all of them) and the recitation of one short Surah being obligatory (wajib) , it is also obligatory on the Khatib to advise the listeners (of their duty to Allah (Glory and Greatness be to Him)) and as much as necessary, must also advise them of the issues relevant to the Muslims. In relation to what information is necessary to convey, it is best that we discuss this issue from the ahadith. Sometimes, the events that are taking place within the world of Islam are things that we must give the good tidings to the other believers about – instances where advancements are made and which are a pride and a boost for Islam and the Muslims and it is good that these things are conveyed to other Muslims. Another time, bad events plague the world of Islam and thus, these too must be conveyed to the Muslims so that they are made aware of the plight of other Muslims – for example, they should know that in this past week what has happened to their brothers in Algeria or other parts of the world. However just as the compiler of Wasa’il ash-Shi’a has stated, this does not need to take up the entire time of the speech. Please note that there are differences of opinion in regards to Salatul Jumu’ah between the Maraja’ Taqlid such as the Late Ayatullah al-’Uzma al-Hajj as-Sayyid Abul Qasim al-Khu’i, the Late Ayatullah al-’Uzma al-Hajj as-Sayyid Ruhullah al-Musawi al- Khomeini, and the present leader of the Islamic Revolution, Ayatullah al-’Uzma al-Hajj as-Sayyid ‘Ali al-Husain al-Khamene’i. Muqallidin of these and other Maraja’ are requested to refer to the books of Islamic law to follow their responsibility to Allah (Glory and Greatness be to Him). Salat al-Jumu’ah is similar to Salatul Fajr in that it is two Rak’at, however during the period of the Occultation of our 12th Imam (may Allah hasten his return) - Salat al-Jumu’ah is a Wajib at-Takhiri prayer which means that on the day of Jumu’ah, the believer can either perform Salat al-Jumu’ah and if all of its conditions have been fulfilled (by the Imam and those present), then this would be sufficient and Salat al-Dhuhr would not have to be performed, or one has the option to perform Salat al-Dhuhr. What Conditions must be fulfilled in order for Salatul Jumu’ah to be performed with a Wajib intention? 1. The time for the Salat should have set in and this is from the beginning of the declination of the sun at mid-day and can be seen by placing a stick in the ground whose shadow will fall towards the west. As the day progresses, the shadow will begin to get shorter until it is almost not visible – this is the beginning of the time of Dhuhr. The shadow will then start to fall upon the east side of the stick and thus, the end time of Dhuhr is when the length of the shadow of a stick or something similar to it is equivalent in length to the stick or thing used (facing East). Therefore, anytime the Salatul Jumu’ah is delayed such that the shadow of the stick is equivalent to or less than the thing used (in the Eastern direction), then the time for this Salat is finished and Salatul Dhuhr MUST be performed. 2. The number of people that must be present is a minimum of five people with the Imam (four plus the Imam of the Jumu’ah). Therefore, if less than five people are present, then the Salat is not Wajib (obligatory) and Dhuhr must be performed. 3. The Imam of the congregation must fulfill all the conditions, such as ‘Adalah (Just) and the other conditions that are also a requirement for the Imam of Salatul Jama’at (Male, Baligh, etc…). Thus, if these are not present, then Salat al-Jumu’ah is not Wajib (obligatory) and Dhuhr must be performed. What Conditions Make Our Salatul Jumu’ah Correct? 1. This Salat must be performed in Jama’at. Thus, it is not correct to perform it individually. In addition, if a follower reaches the Imam before he goes into Ruku’ of the second Rak’at of the Salatul Jumu’ah and joins in at this point, then it would be counted as one Rak’at and he must perform one Rak’at after the prayer on his own (he must complete two Rak’at) and his Salatul Jumu’ah would be correct. However, if he reaches the Imam while in the state of Ruku’, then according to Ihtiyat Wajib, the believer is not permitted to count this Salat as Jumu’ah, and thus, he MUST perform Salatul Dhuhr. 2. Two speeches must be given before the Salat. In the first speech, the speaker (Khatib) must praise Allah (Glorified and Exalted is He) and glorify Him and the believers must be enjoined to have Taqwa and keep away from sins and this must be done in ‘Arabic and the language of the people (if they do not understand (Arabic). In addition, one short Surah of the Qur’an must also be recited after the first speech. The Imam must sit down briefly and then stand up for the second speech. The second speech too must contain the praise and glorification of Allah (Glorified and Exalted is He) and prayers must be sent upon the Prophet (blessings of Allah be upon him and his progeny) and the Ahlul Bait (blessings be upon all of them). According to recommended precaution (Ihtiyat Mustahab), the Imam must also pray for the forgiveness for all the believers and must also advise those participating to observe Taqwa of Allah (Glorified and Exalted is He). two speeches before the declination of the sun. 2. It is obligatory that the Imam giving the speeches must do so standing up. 3. The Imam must sit briefly between the two speeches for the Jumu’ah to be correct. 4. It is obligatory that the person who gives the speeches and who leads the Salat is the same person – thus, it is not permitted that two people split the duties. done in Arabic. Rather, if a majority of those who are present do not know Arabic, then according to Ihtiyat Wajib, the main speech, especially advising to Taqwa and piety must be in the language of the people. If the Salatul Jumu’ah is established by the Infallible Imam (peace be upon him) or his specially designated representative, then this salat will - according to Ihtiyat Wajib - become Wajib (Obligatory) to attend. However, during our time when the Imam (may Allah hasten his return) is in Ghaybah, it is not obligatory to attend. 1. When the Imam is giving the speeches of Jumu’ah, the followers should not speak as this act is his highly discouraged, however if a person speaks during the speech and this prevents others from hearing the speech, then according to Ihtiyat Wajib, it would not be permitted (haram) to speak. 2. According to Ihtiyat Wajib, those attending must listen to the two speeches, however for that person who does not understand the speech (in the language it is given in), it is not obligatory for him to listen to two lectures. 3. Since the two speeches “take the place” of the Salat of Dhuhr (in addition to the actual Salat of Jumu’ah), thus the believers are required to sit and face the Qiblah just as they would do when offering any of their daily Salat. In addition, one should also maintain all the etiquette that he would during the Salat (Wudhu’, etc…) while listening to the two speeches. قٰالَ جٰاءَ رَجُلٌ ﺇلَىٰ رَسُوْلِ اللهِ (صَلَّىٰ اللهُ عَلَيْهِ وَ آلِهِ وَ سَلَّمَ) فَقٰالَ يٰا رَسُوْلَ اللهِ مٰا الْعَلْمُ؟ قٰالَ أَلْاِنْصَاتُ قٰالَ ثُمَّ مَهْ قٰالَ أَلْاِسْتِمٰاعُ قٰالَ ثُمَّ مَهْ قٰالَ أَلْحِفْظُ قٰالَ ثُمَّ مَهْ قٰالَ أَلْعَمَلُ بِهِ قٰالَ ثُمَّ مَهْ يٰا رَسُوْلَ اللهِ قٰالَ نَشْرُهُ . Al-Fath Al-Mubin Publications, named after the introductory verse of Surah 49 of the Noble Qur'an, Al-Fath, was formed in late 1999 to facilitate the publication of Islamic literature by providing the services of typesetting and graphic design for book covers for Muslim Publishers. After assisting the Islamic Humanitarian Service in the design and publication of over 12 books and the World Federation of KSIMC based in the UK as well as other individuals and organizations throughout North America and the world, it was decided to expand our efforts into other areas, specifically in the spread of the true teachings of Islam as taught by the Prophet and his Ahl al-Bait (prayers be upon all of them). It should be noted that we are independent of all other organizations and charities and are not affiliated with any political or religious parties or groups. In the year 2002, we were blessed to be able to publish our first work, Secrets of the Hajj written by the Marja’ Taqlid and great scholar of Irfan and Akhlaq, Ayatullah al-’Uzma al-Hajj Shaykh Husain Mazaheri (may Allah grant him a long, healthy life in the cause of Islam). This book looks at the spiritual (Irfani) aspects of the hajj – something not covered by any other book on the market today. The second book that was published in the Spring of 2003 was Morals of the Masumeen which is a 48-page activity book for young Muslim children. Packed with activities, stories and ahadith from the Masumeen, this book opens up a new chapter in the dissemination of Islamic teachings to the younger generation. In addition to these two works, we currently five other publications either in translation or under editing which should be available soon. Our website currently hosts close to 100 originally translated articles on Ethics, Morality, Prayer and Supplication, History, Theology, Biography and other topics. Full length books in PDF format and posters of ahadith and other gems of Islamic guidance are all available on our site for free reading / download at www.al-mubin.org  which Muslims of ages and interests will be able to benefit from, Insha-Allah. In addition, we are able to assist publishers and Muslims authors in typesetting and design of cover work for your book or magazine. For rates and more information on this service, please get in contact with us via e-mail.